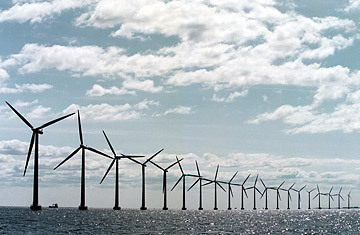 An offshore windmill farm located in the Oeresund, three km from Copenhagen harbour. Copenhagen is a very nice city in a very nice country. And if you're like me, that's all you might know about the place, along with the fact that was once home to Hans Christian Andersen, Kierkegaard and Hamlet. But next winter, Copenhagen will become the center of the climate change world. In December 2009, the capital of Denmark will host the 15th meeting of the Conference of Parties to the Kyoto Protocol, better known as the UN climate change summit. It happens every year  the most recent one was held last December on the Indonesian island of Bali  but Copenhagen will be special. The Kyoto Protocol, which now commits nearly every developed nation except the U.S. to specific cutbacks in greenhouse gas emissions, expires in 2012. Given the lag time in such mind-bendingly complex international negotiations, we need to have a plan in place by the start of 2010 to ensure that there isn't a fatal gap between the expiration of Kyoto and whatever comes next. (If a year or two should pass without a clear international cap on CO2 emissions, both government and industry might lose the incentive to invest in greener technology.) All of which puts a lot of pressure on little Copenhagen. More important than its uber-European urban livability, Denmark is taking its responsibility as the host of the 2009 climate summit seriously. Last year the government split its Environment Ministry in two. The original, now smaller, Ministry of the Environment was tasked with covering local pollution and wildlife issues, while the new Ministry of Climate and Energy was formed to focus specifically on global warming and alternative energy, with an eye toward preparing the way for Denmark's leadership on climate change  at the UN summit and at home, by further reducing its own carbon footprint. "We know we have a responsibility for Copenhagen," says Connie Hedegaard, the Danish Minister for Climate and Energy. "We'll live up to it." Of course, if Denmark really were running international climate negotiations, the world would be in much better  and cooler  shape. But ultimately, the road to a new climate deal runs through one city: Washington. "The U.S. has to be a part of any new climate agreement," says Rajendra Pachauri, the chairman of the UN's Nobel Prizewinning Intergovernmental Panel on Climate Change. "In the absence of that, you won't have a response from the large number of countries needed for a collective response." If Washington leads, the big developing countries like India and China will be forced to follow, or stand alone against an emerging international consensus. Will that happen? We will have a new Administration by 2009, and both John McCain and Barack Obama are considerably greener than the current White House occupant. But with Americans obsessed over the price of gas  but not rising global temperatures  it'll take real political leadership to from Washington to make Copenhagen a success.